I made Sausage Appetizer Bites for New Year’s Eve because the guys love it! It’s a filling, hearty appetizer with no fancy flavors or parts — just good stuff together! I made it again recently and barely saved enough for a picture. You’re lucky I have no compunction about grabbing food off their plates for a photo! Bytes tried to put teethmarks in all of his but I was faster. And then I couldn’t get a knock your socks off photo . . . . You’ll have to take my word with scant photographic proof that this is a taste worth fighting for. . . it is! Use the full crescent sheets if you can. Otherwise press the seams together on the perforated crescent dough. Grease or spray the baking sheet and work with the first package of crescent dough directly on the cookie sheet. Stretch it a little larger as you work — maybe an inch longer and an inch wider — half an inch each way. The type of sausage you choose will determine the flavor. I use Bob Evans or Jimmy Dean original, but if you like more kick, choose appropriately. Stir frequently while browning the sausage. Cut the cream cheese in squares of an inch or two so it will melt more quickly. Spoon the meat and cream cheese over the dough and use the spoon to distribute the mixture evenly, stopping at least half an inch from the edge of the dough. Open the second package of crescent dough, unroll and carefully place on top of the meat mixture, stretching and patting perforations together. Press the edges together all the way around, lifting the first layer to meet the second if necessary. Bake in preheated oven and cool for a few minutes after removing from the oven. A Pizza cutter works well in cutting 1 inch by 1 inch pieces. Serve — but stand back immediately! Great for the big game or any time you want to serve a hearty appetizer. I also serve it for a light supper. Cut it into larger pieces about four inches by three inches, add a salad and a cookie. So good! Creamy sausage bites in a golden crust -- melt in your mouth goodness! Brown sausage over medium heat, stirring frequently to break up any pieces. When brown drain grease and return to pan. Cut cream cheese into thirds across and then cut in half the long way. Add pieces to hot sausage and stir until melted. In the meantime, spray cookie sheet with cooking spray and spread one sheet of crescent dough on cookie sheet. If using crescent roll dough, press dough together at perforations. When cream cheese has melted, spread sausage and cheese mixture on dough leaving half inch margin all around the mixture. Open second can of crescent dough and spread on top of mixture. Press edges of dough together to prevent meat and cheese from oozing out. Fold up bottom layer over top layer if necessary. Bake at 375 until golden brown, about 20 minutes. Let set about 5 minutes and cut with sharp knife into 1inch squares. Wow do these look good, they almost remind me of biscuits and gravy! Thank you so much for linking this up at the Shine a Spotlight Saturday Link Party on Angels Homestead this week! oh wow – these look delish! This look delicious! I love recipes like this, they are good for breakfast or dinner!! Pinned! Thanks so much for linking this up at Sewlicious Home Decor. This looks delicious and easy to make. Thanks for the recipe! These sound great! I will be trying them ASAP!! 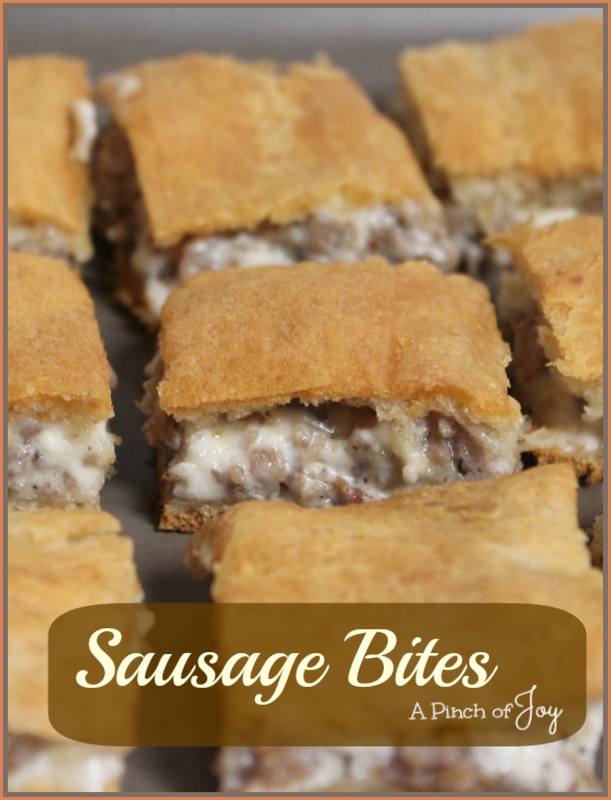 I love your Sausage Bites, what a great appetizer for the big game! Thanks so much for sharing with Full Plate Thursday and hope you have a great weekend! These look delicious. Definitely something to consider for Superbowl Sunday. I have a recipe similar to this and the boys love them. The only difference is my meat mixture has chopped jalapeños (Arizona style) and I make little triangular pockets from the crescent rolls (like a mini Runza). Hi Rita — I bet this would be good with different seasonings and making pockets would be easier than trying to smoosh the perforations together — good idea! Love that you use jalapenos and Runza in the same sentence and it made perfect sense — only a NE/AZ person could do that! LOL! Hope you had a great birthday!